She believes she is home now, right where God wants her to be—sharing life with her Franciscan sisters, working with teenagers and living close to the animals that she loves. As she travels the twisting, hilly roads in southeastern Indiana that lead to Oldenburg Academy of the Immaculate Conception, Franciscan Sister Clare Teixeira marvels at the remarkable life journey that has brought her to this part of the world. For 14 years, she was married to the man she loved deeply—“a wonderful life” in Florida that ended in heartbreak, with her wanting to die. She has also lived in New Mexico, doing mission work for a Catholic parish that ministered to the Navajo Indians. 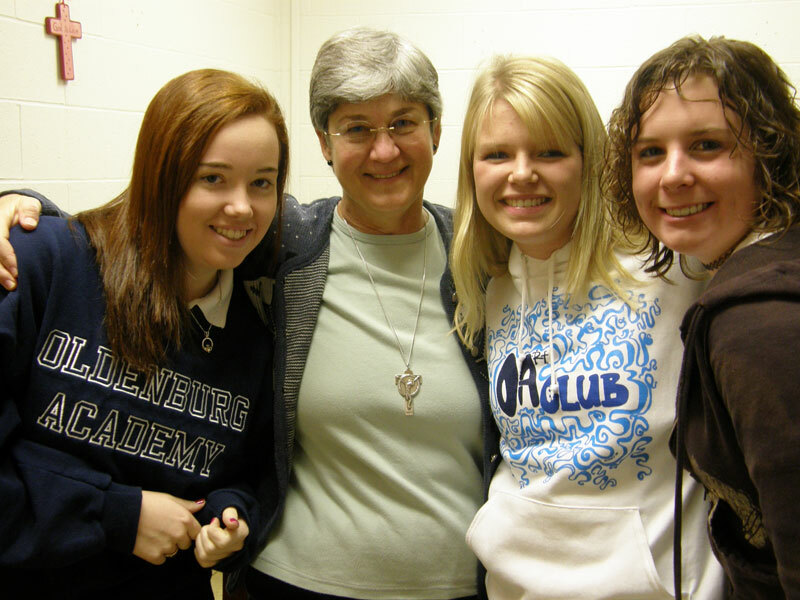 And now at 56, she is in Oldenburg, living the life she often dreamed of as a child—“caught up in God,” wanting to be a religious sister who makes a difference in the lives of students. After three years in the Franciscan order, she professed her first vows in August. She is scheduled to profess her final vows as a Franciscan sister in 2012. Named Stephanie Kozlowski at birth, she had wanted to become a religious sister after graduating from high school in Miami, hoping to join the Adrian Dominican Sisters, who taught her in grade school. But the order encouraged young women to first get a college degree and work experience. She eventually taught religion and music at an all-girls academy in Florida, a time when she met Richard Teixeira, a teacher at an all-boys high school. Even with the demands of the farm, the couple kept their focus on their faith. Still, there came a time in the fall of 1997 when Rick wondered about the depth of their faith. “He said because everything was so wonderful and smooth, he wondered whether we would still be faithful if we had a tragedy,” she recalls. “He said he was going to pray so God would test us. In January of ’98, he had a lesion on his tongue that was diagnosed as cancer. The doctor said there were really no options. He handed Rick a death sentence. “I wanted to die myself,” she says, almost in a whisper. She kept going because of a conversation she had with Rick shortly before he died. At 45, she began contacting several religious orders to express her interest, but she was told she was too old. So she decided to follow where God led her and began to travel, including to the Holy Land and Medjugorje. She then moved from Florida to New Mexico in 2004, hoping to find a volunteer opportunity to work with the Navajo Indians. She became the mission coordinator at St. Mary’s Mission in the New Mexico community of Tohatchi. During that time, she became close with two Oldenburg Franciscan sisters who also ministered there. She was happy there, but then her younger sister, Gail, died in 2004 on Aug. 11, the feast day of St. Clare. She entered the Congregation of the Sisters of the Third Order of St. Francis in Oldenburg in 2006. She serves as a secretary in the guidance office at Oldenburg Academy, a private Catholic high school for about 215 students. She appreciates that the Franciscan sisters’ community also includes a farm. She has also found a home, according to Franciscan Sister Diane Jamison, the formation director for the Oldenburg Franciscan sisters. Joy is part of Sister Clare’s life again.